RANGERS returned to winning ways thanks to a deserved 2-1 victory against one of the Sky Bet Championship promotion favourites in Middlesbrough. 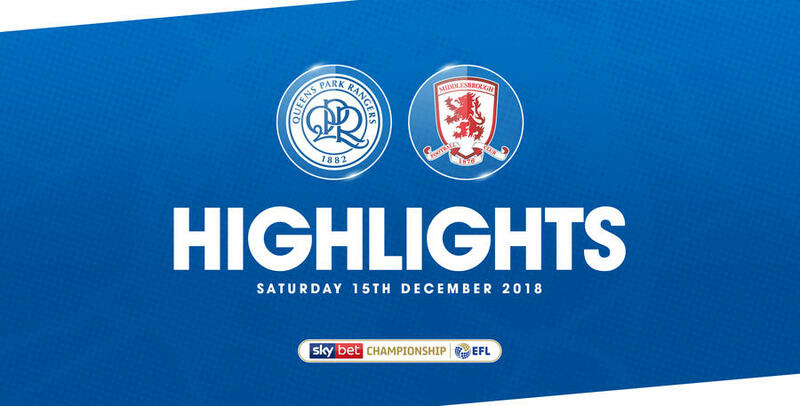 In truth, the R’s were excellent value for the win at Loftus Road – twice breaching a Boro defence who had only conceded 14 goals in 21 league affairs previously. Pawel Wszolek got the ball rolling for QPR with a close-range effort in just the fourth minute, ahead of Tony Pulis’ charges drawing level through George Saville in the 51st minute. It was Steve McClaren and his Rangers team who were ultimately triumphant, though, after Nahki Wells’ emphatic finish on 60 minutes. Following last weekend’s slender defeat at second-placed Leeds United, Hoops boss McClaren was forced into two changes for the visit of former employers Middlesbrough. Injuries picked up in that Leeds loss ruled out both Angel Rangel and Geoff Cameron, so into the side came Darnell Furlong – following his own lengthy spell on the sidelines – and Jordan Cousins. In a 4-4-1-1 formation, the R’s lined up as: Joe Lumley; Furlong, Toni Leistner, Joel Lynch, Jake Bidwell; Wszolek, Massimo Luongo, Cousins, Luke Freeman; Ebere Eze; Wells. Despite some atrocious west London weather, Rangers were quick out of the blocks. Indeed, it took the R’s just three minutes to first threaten, with Wells spinning Boro’s Britt Assombalonga on the right-hand side of the box before shooting only inches past the far post. A minute later, QPR took the lead. Following some patient approach play, Freeman slipped in Bidwell down the left, who in turn crossed for Wszolek to slide home from all of a few-yards out. Lift-off at Loftus Road – and Rangers didn’t relent thereafter. In the ninth minute, Lynch’s long-range blast so nearly freed Wells before visiting goalkeeper Darren Randolph gathered, then Wells threatened again two minutes later when he skipped past Aden Flint before seeing his subsequent effort deflect wide. This contest had turned into a bit more of a scrap when the midway point in the first half arrived, though Rangers continued to press for a second goal. Just before the half-hour mark, Wells escaped the attention of two Middlesbrough defenders before dragging an effort marginally wide from 12 yards. McClaren’s men turned in a solid defensive display before the break, limiting their visitors to very little goalmouth action. In the 33rd minute, following some more home pressure, George Friend led a one-man Boro counter attack but could only fire his eventual effort high and wide. The R’s posed the greater goal threat in the opening period, and it was Wells who enjoyed another opportunity on the stroke of half-time. Furlong did well to dig out a cross from the right, before the Bermuda international glanced his header wide. A good first half, then – but Rangers were dealt a double blow shortly after the interval. Moments after Lynch was forced off through injury – and eventually replaced by Josh Scowen, leading to a slight R’s reshuffle – Boro levelled matters on 51 minutes. Ryan Shotton’s ball into the penalty was only half-cleared by Furlong, before George Saville thundered his edge-of-the-box effort past Lumley and into the bottom right-hand corner. With parity restored, the visitors exerted some pressure following their equalising goal. But Rangers hit back by regaining the lead on the hour mark thanks to a swift home attack. Lumley’s quickly-taken free-kick to Eze saw the latter subsequently pick out Wszolek down the right, before the Pole’s pull-back was hammered home by Wells. QPR’s second goal handed them a bit of momentum back. In the 63rd minute, an Eze shot was blocked before another from Luongo was, too. Then Scowen volleyed over from the resultant corner. The R’s spurned even-better opportunities to add a third on the counter attack in minutes 73 and 83. First Eze and Wells broke before Boro recovered to avert the danger. Ten minutes later, Wszolek slammed wide from the right-hand side of the box. By now, Rangers should have put the game to bed. Luongo also went close in the 86th minute, following a 25-yard drive that crept just over. Thankfully, the R’s weren’t made to pay in the end, safely seeing out the game during four minutes of stoppage time to take three precious points. Two-one to the Super Hoops. WATCH highlights from QPR's 2-1 victory over Middlesborough at Loftus Road on Saturday evening.